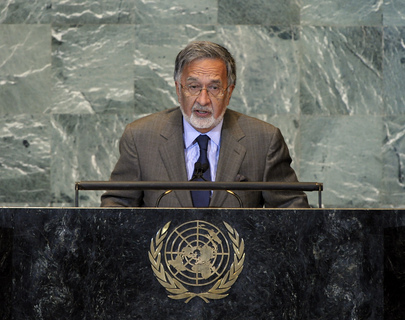 ZALMAI RASSOUL, Foreign Minister of Afghanistan, speaking on behalf of President of Afghanistan Hamid Karzai, said his country was mourning this week’s assassination of former President and Chairman of the Afghan High Peace Council Professor Burhanuddin Rabbani, a champion of peace. He also commiserated with people of the United States for their sense of loss rekindled by the recent tenth anniversary of the 9/11 terrorist attacks. Afghanistan would soon mark 10 years since the end of the Taliban, which brought great access to education and health, as well as development of infrastructure. But gratitude and pride for those achievements was tempered by the absence of security. He said that the international fight against terrorism must be reviewed and adjusted. Ordinary Afghans suffered unspeakable losses while terrorist sanctuaries remained untouched far away. Indeed, continued credibility of the fight would depend on focusing where terrorism originated. But military action was not the only solution to the Taliban insurgency. The offer of reconciliation had been extended to all Afghans in a comprehensive effort to make the political process a more inclusive and acceptable alternative to violence. “Clearly, without sincere cooperation from regional and international partners, notably the Islamic Republic of Pakistan, this strategy will not succeed,” he said. It was a crucial year for Afghanistan, as it began the transfer of security responsibility from international forces to Afghans by the end of 2014, from which the country would emerge sovereign, self-reliant and at peace, he said. That progress depended on the resolve of the people and the continued support of the international community, but it would also require a lengthy comprehensive economic transition. At the International Conference on Afghanistan in Bonn, Germany, later this year, the Afghan Government would call for commitments to the post-2014 period and share its vision to emerge in the next 10 years as a regional hub for trade and transit. He said his country was also working closely with Turkey towards a regional conference on cooperation in November to boldly address political differences, cooperating in the face of common challenges such as terrorism, extremism and the drug trade. Developments were also hugely influenced by events in the wider world, and Afghanistan was anxiously watching the situation in the Middle East, particularly developments in Libya, where he urged inclusivity and safeguarding of the unity of the Libyan nation. Afghanistan also called for an immediate end to the suffering of the people of Palestine and stood firmly behind efforts aimed at their full membership in the United Nations.